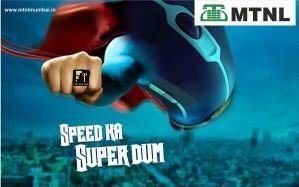 In a bid to cater high end customer who needs constant speed on Broadband, Mahanagar Telephone Nigam Ltd (MTNL) today announced the launch of new ultra high speed 8 Mbps tariff plan for ADSL Broadband service with line bonding in Mumbai Telecom circle. MTNL‘s new 8 Mbps Broadband Plan with line bonding comes at monthly rental of Rs.2998 provides 60 GB data usage at 8 Mbps speed there after additional data usage charges will be 10 paisa per MB up to 120 GB and afterwards 5 paisa per MB for further usage. Line Bonded Broadband is a cost-effective alternative to leased lines and other more expensive broadband solutions for businesses and corporate houses which combines multiple ADSL or broadband lines together to provide one big fat Internet connection with constant speed. The above plan is launched as promotional plan for 90 days effective from 08.10.2012 to 05.01.2013. Apart from Line Bonding 8Mbps ADSL Broadband plan MTNL offering various 1Mbps and 2 Mbps Unlimited Broadband Plans starting from Rs.450 and 10 Mbps FTTH Unlimited Broadband plans (with FUP on Speed) starting from Rs.790 per month in Mumbai circle. For more details on MTNL Broadband dial 1500 (toll free from MTNL) or 022-22221500. Their FTTH plan is not available in all areas of mumbai,they should take steps to make it available..
Why are they competing with themselves? Their FTTH plans are better than this both in speed and cost. If someone has the option of FTTH, why would they take this?